Washington State University researchers Shannon Tushingham and David Gang with some of the ancient pipes on which they found nicotine residues. Tests performed at Washington State University have found that people smoked tobacco in the Pacific Northwest going back more than a thousand years ago. Researchers analyzed chemical residues inside a dozen smoking pipes and pipe fragments collected from archaeological sites along the lower Snake and Columbia rivers. The WSU scientists asked themselves, "What were they smoking?" Archaeologist Shannon Tushingham suspected the common shrub kinnikinnick, also known as bearberry, would be the answer. But it wasn't. 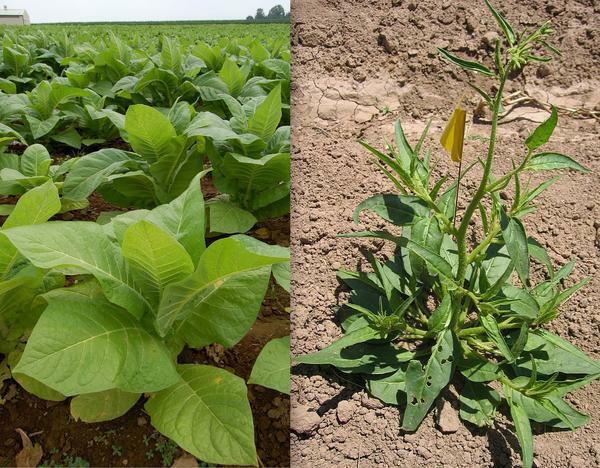 "Tobacco was definitely a smoke plant that was used consistently for 1,200 years," Tushingham said, describing the results from the mass spectrometry testing. Previously, Tushingham said there was "quite a bit of question" whether Native Americans of the interior Northwest used wild tobacco as a smoke plant before European contact. Early explorers and traders found an eager audience for their more potent dried trade tobacco when they arrived on the scene in the late 1700s and 1800s. The indigenous, wild tobacco species that grow in the western U.S. are related to but do not resemble the farmed tobacco that you might picture drying in a Kentucky barn today. Coyote tobacco (Nicotiana attenuata), which can still be found on sandy river bars in the Northwest, is a low, scrubby annual with smaller leaves than domesticated tobacco. Another species known as Indian tobacco (Nicotiana quadrivalvis) occurs naturally as far north as southwestern Oregon. Both have lower nicotine content than today's commercial crop. "There is some evidence in different places of the Northwest that Native people had little plots, that they farmed quadrivalvis because it was a very special, powerful plant," Tushingham said. "They were managing this plant. It didn't grow naturally in the Northwest." Tushingham said the limited availability and lower nicotine levels made it unlikely that anyone could indulge a pack-a-day smoking habit as occurs today. "What we see at (Euro-American) contact is that only certain people could use tobacco and they used it at certain times," she said. A National Science Foundation grant to study human use of psychoactive plants in ancient North America funded the newly-published study, which appeared Monday in the journal Proceedings of the National Academy of Sciences. Tushingham's team collaborated with the Nez Perce Tribe on the research project. The tribe was interested in documenting traditional tobacco use as well as bolstering culturally-specific health and anti-smoking initiatives. Ethnographer Josiah Pinkham with the Nez Perce Cultural Resource Program said he was struck by how far back the WSU researchers were able to establish tobacco use and infer trading. "It was quite impressive, the validation of the longevity of the relationship with tobacco," Pinkham said in an interview Monday. Pinkham said the Nez Perce Tribe participates in a nuanced, national tobacco abuse prevention campaign called "Keep It Sacred." A theme of the Native American-focused campaign is that tobacco is for ceremony, not for casual use. "There were spiritual uses for different types of tobaccos and ceremonial and ritual uses," Pinkham said. Some of the stone pipes examined in the study came from ancestral Nez Perce villages along the Snake River that were excavated by archaeologists in 1969-70 shortly before being permanently flooded by the construction of Lower Granite Dam. The Nez Perce recently received a $200,000 federal grant to support the tribe’s efforts to reduce disproportionately high rates of cigarette smoking on the reservation while preserving ceremonial traditions that make use of tobacco.